NOW: On Saturday we had originally planned to go to the park until lunchtime and then start our journey home….hoping the kids would take a nap, at least for a little while. Well, they had enjoyed the parades so much…..and Tim and I just really didn’t want to leave yet…..so we decided to wait until after the parade. It was under one condition though – – – – – – coffee stops – – – – – in the park, and all the way home. In the morning we ate breakfast in the hotel room again, after Tim took all the luggage down to the car. We’d have to unpack it to get the stroller out, and then repack it after the park, but that was ok. 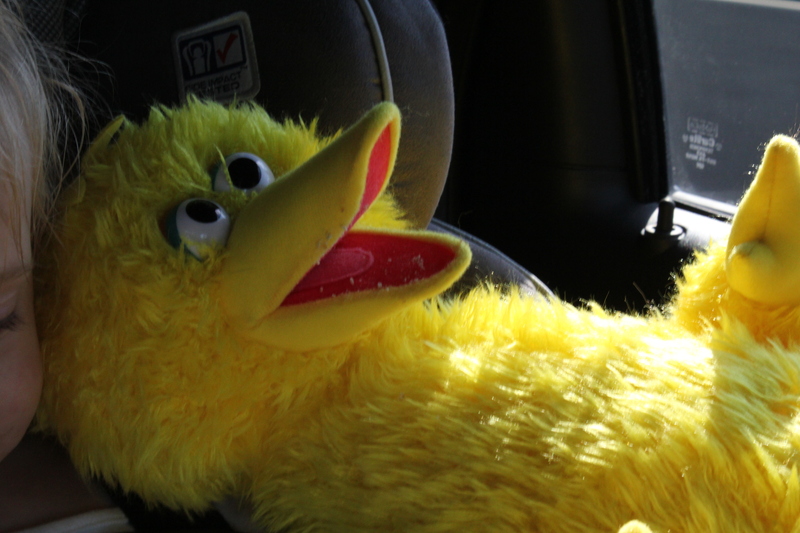 The kids were just so excited to go back to Sesame that we knew we made the right choice in returning for a third day. We had gotten the free upgrade to the season pass anyway, so why not? We decided not to deal with water stuff because it took up a lot of time, we’d have to get them changed again, and we wanted to try some things we hadn’t. We started near the back of the park with some dry rides. We asked the kids if they wanted to go on the horsies, but both said NO. Ok then. 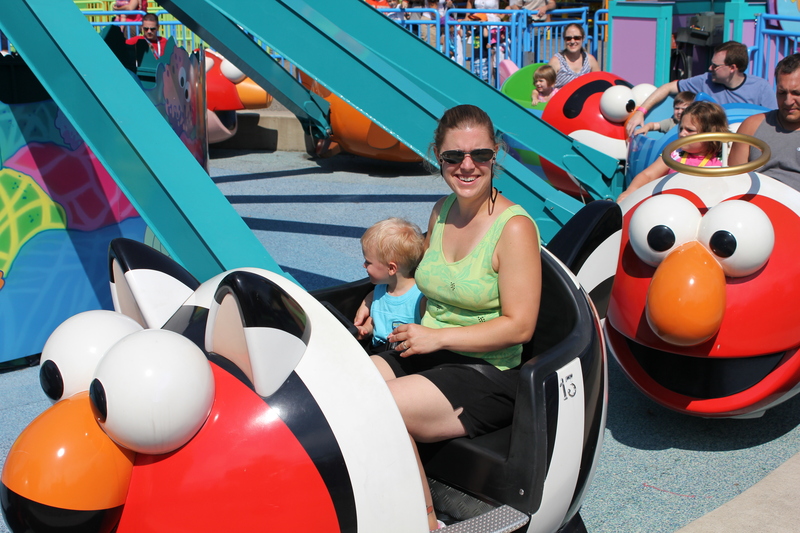 We found Elmo’s Flyin’ Fish and asked if they wanted to go on. 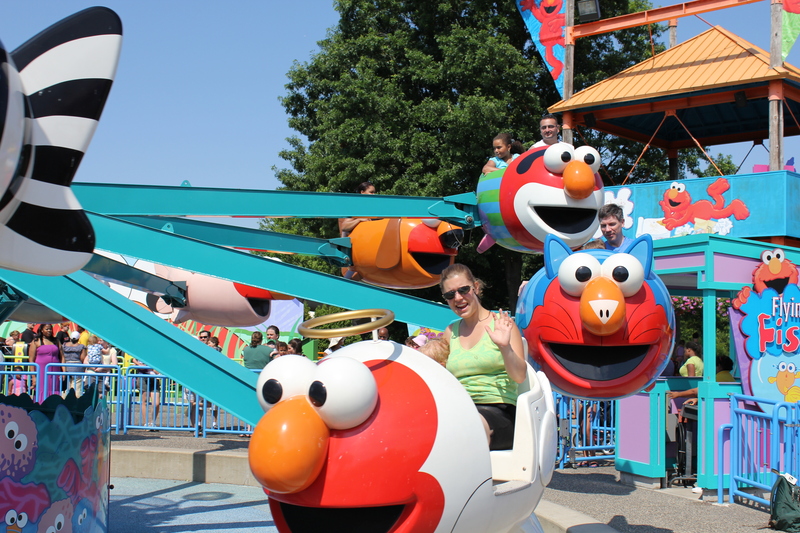 At first they both said no, but then Will heard Elmo’s voice coming from the ride and decided he’d like to try. I gave him his choice of fish as we waited in line. Zebra. In line, he was all excited and kept pointing to the zebra fish as it went around and telling me whenever he heard Elmo. Once on the ride, he kept saying all done all done. But too late. 🙂 We took off and he was looking at everything and waving to Daddy and Ariel. He even let me push the button to go up high. 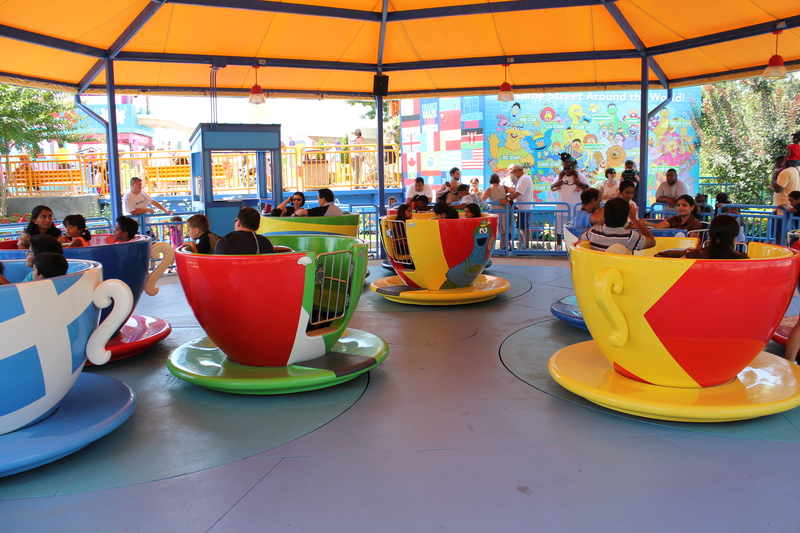 It was a lot of fun…..so when we got off, I asked Ariel again if she wanted to go on, like Will. She still said no, but when I tried to take her out of the stroller she didn’t really resist. We started walking toward the line and she was saying no, no, no – in a cute way, not crying or whining. So, I figured she should go on too. She wouldn’t tell me which fish she wanted so I picked the angel fish because it was landed near Daddy. When I first buckled her in, she said all done all done, but I told her it was too late, just like with Will. She ended up enjoying herself also! We decided to take a break and catch the Elmo’s World Live show again. We sat near the middle this time, and no one was in front of us at first, which was perfect. About halfway through the show someone came in (LATE!) and sat her big-self right in front of us. I was so annoyed. And Will was annoyed too, he had to keep leaning around her to see. But they enjoyed the show anyway. It was much better than the first day when Ariel was miserable through the whole thing! The workers even let us stay back a little bit after everyone was gone so we could get pictures on the set! 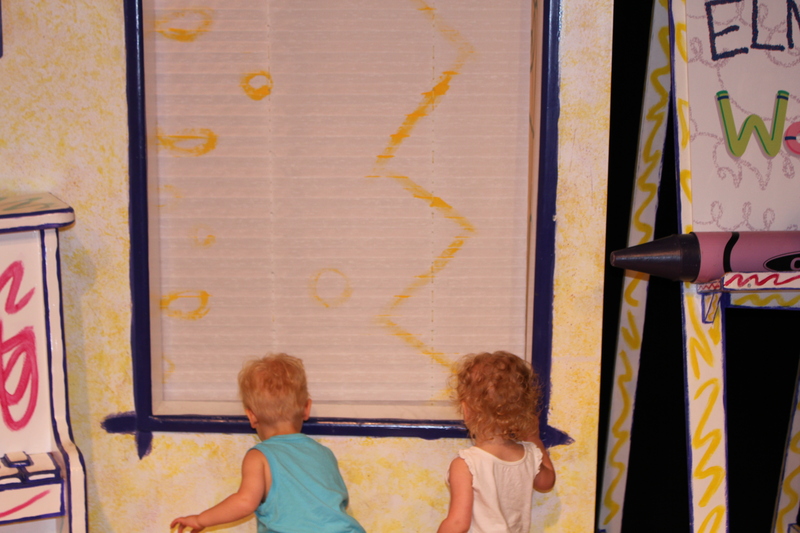 They loved looking at shade and door and meeting Dorothy!!! 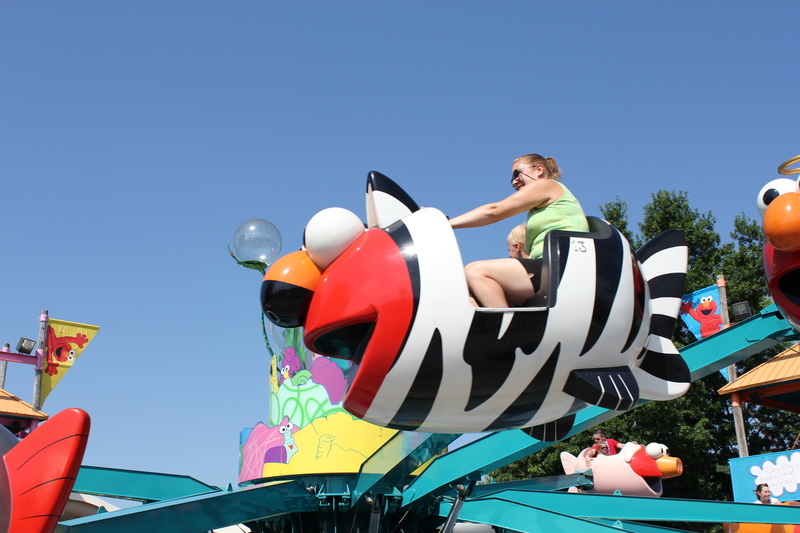 Then we went back to the rides. 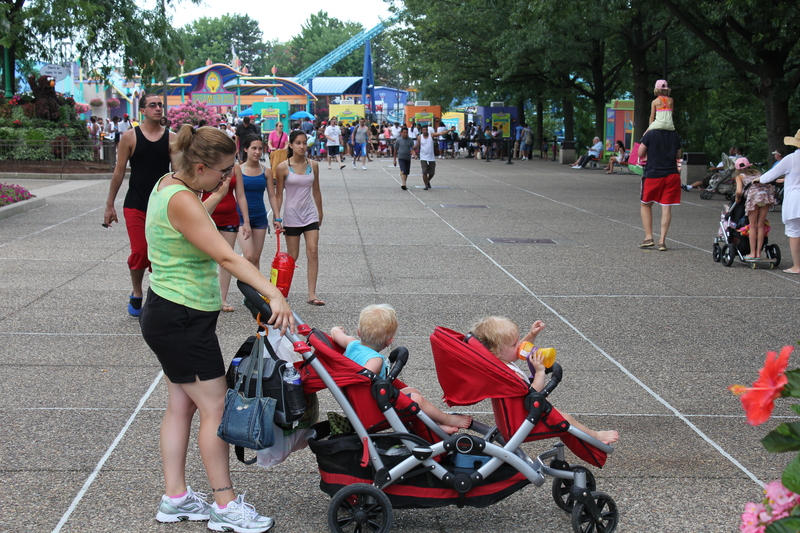 The twins agreed to go on Grover’s World Twirl with Mommy and Daddy. I think they would have been fine if they could have sat on our laps, but they had to sit on the seat between us and didn’t really seem to enjoy it as much as I thought they would. They weren’t crying, but they weren’t too thrilled either. We decided to go for lunch and then sewttle in for a spot on the parade route, near where we were for the nighttime parade last night. While waiting for Tim to get lunch, I grabbed my 4th coffee of the day and settled in to wait at a table with the twins. Tim brought me back a surprise with my lunch! I shared with the kids, of course. While we waited for the parade, Tim got us some “IceWater”, which was basically sorbet – he got cherry, which was really, really good! 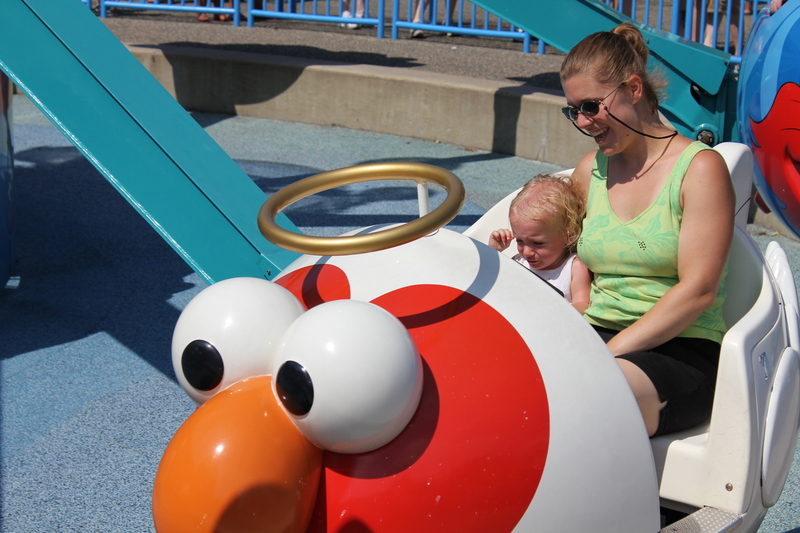 We saw the parde one last time and then waved bye-bye to Sesame Place. As we were unpacker/repacking the car to fit the stroller in, the kids fell asleep in the backseat. 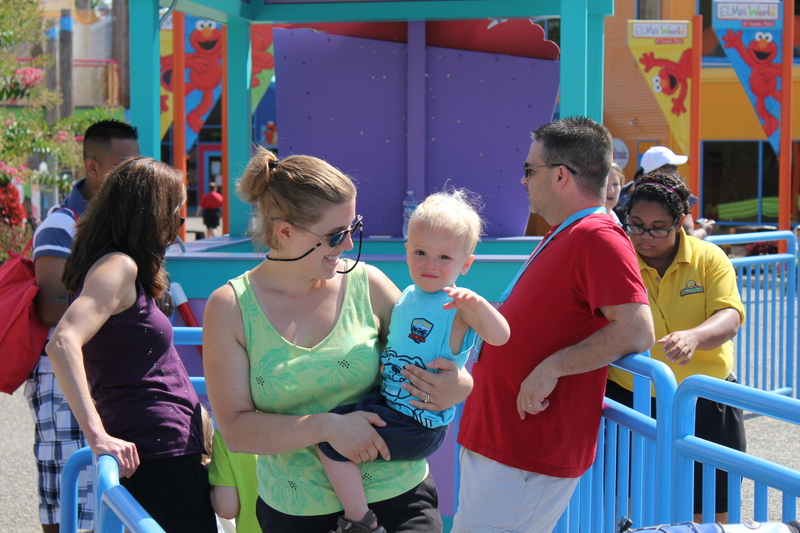 But, we still had one more Sesame Place surprise for them. 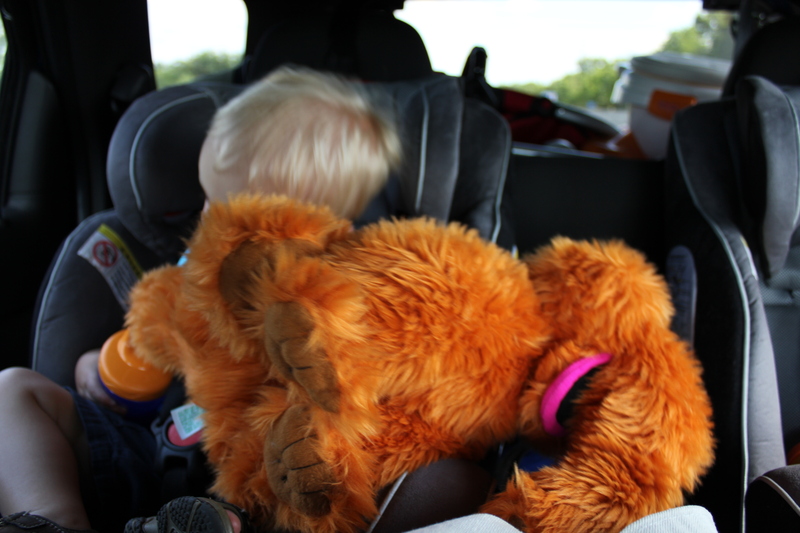 When they woke up, we stopped at a rest area (so Mommy could get another coffee) and after settling back into the car……. Ariel must have thought Big Bird was hungry so she was feeding him some of her fruit bar. He got his beak quite messy! Things were pretty uneventful on the way home. About an hour past dinnertime there was a pretty good amount of whining coming from the backseat, but we really wanted to make it to the Applebee’s near Syracuse again. So we carried on. At dinner, Will was a bit of a terror. Good thing we won’t be going back to that location anytime soon. 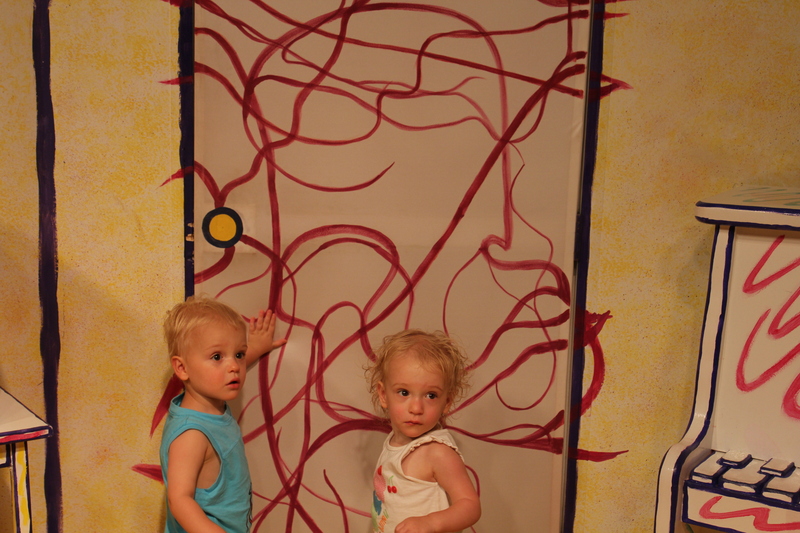 It was understandable to us…..but probably not to the customers….or the waitress who will have to wash the crayon off the wall. Considering they usually get compliments in restaurants, it was a little out-of-sorts for him, but to be expected. After dinner we got back on the road, but abruptly pulled off because Mommy saw the first Tim Horton’s sign! YAY! Extra-large please. They fell asleep shortly after, waking up occasionally to cry a little, but then falling back asleep. Sometimes it was actually good that they were crying because it helped me stay more awake. I wasn’t falling asleep at the wheel or anything (I would have had Tim drive if I was), but I definitely was tired. It helped that we had a Muppet marathon going on the iPod, singing along was definitely helping. We carried them upstairs, got them into their jammies and settled them into their cribs. We also started unpacking the car a little. By the time we got home it was about 12:30 at night (morning). At one point Tim asked, “is it strange that I even enjoyed the car ride?” No. Anytime we spend time together as a family is enjoyable. Even though part of the time was spent with whiny kids. And part of the time was spent trying to entertain whiny kids. And part of the time I wished I could just teleport us home because I just wanted to be there instead of driving any longer. It was all so worth it. For the experience. For the joy. For the fun and the time spent together. 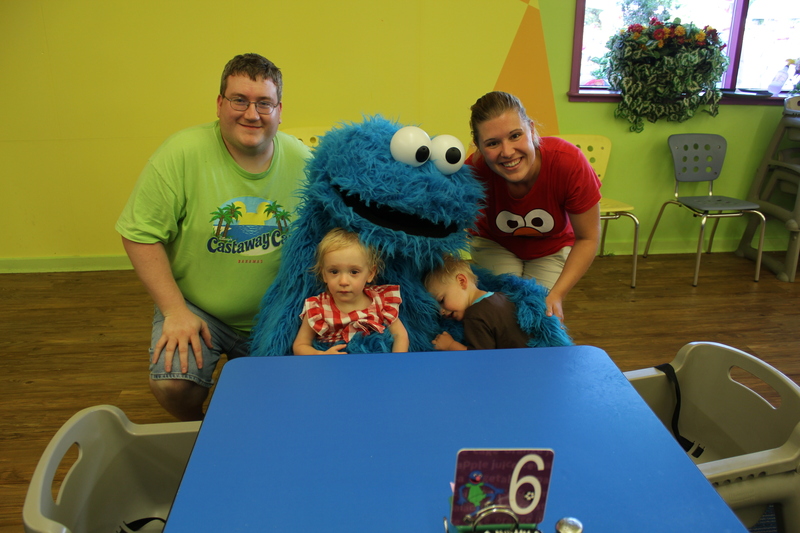 If I was only going to go to Sesame once, I might recommend waiting until the kids were a little older. I definitely don’t regret taking mine because I know they had such a great time. But they were a little young for some things. 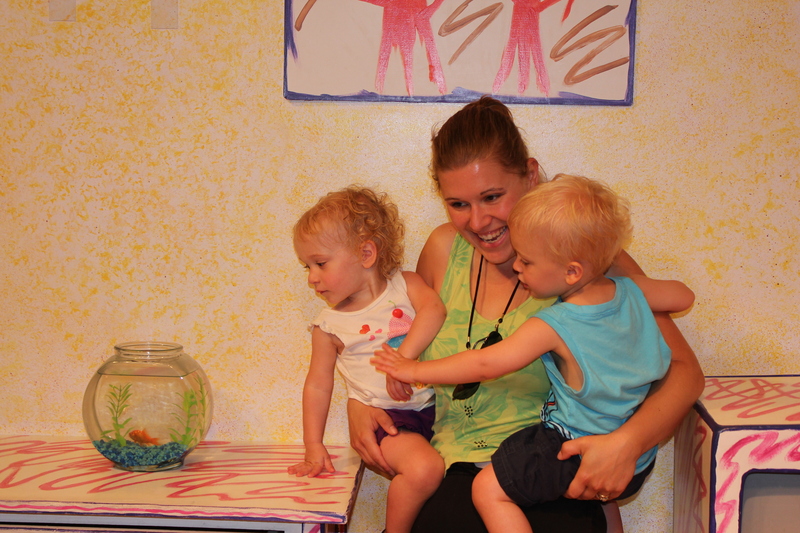 If we do go again in a couple of years, we will probably go for longer and check out other things in the area; the Crayola Factory, the Please Touch Museum, or even Hershey Park. And I know they might not remember it. Right now they do. I ask them questions and they give me VERY specific answers about what happened on our trip. But we have the pictures and the video (that they’ve asked to watch every day since we got back) to help them remember. I remember going to Canada’s Wonderland as a kid. But I don’t really remember it……I just remember what I’ve seen in the photos. And that’s ok. Because I know I had fun and my family must have enjoyed it or they wouldn’t have kept taking me back. I can’t even express how much we all enjoyed our first family vacation. My tears during the parades, and while they met the guys, and while they showed us how excited they were, and even now as I type; just say it all. Tim and I have memories that will last forever – even when our little ones aren’t so little and don’t delight at seeing all their now-favorite guys. This is now. Soon……….let’s get planning that Disney World trip!!!! It never fails that someone will sit or stand in front of me when I’ve gone to the ballet or concerts. They always seem to be the type that have to constantly lean over and talk with the person with them or they seem to have a ginormous head and then I end up not being able to see anything.I want to tell them “can you move your head over to the left and just keep it that way”. heehee.